[2016 June] Rabbi Lerner – Master of Compassion or Master of Deceit? “American Jews played an important role with African-American struggles,” the Rabbi insisted. This is certainly the case but, of course, Jews also played an important role in the African slave trade. The Rabbi missed a great opportunity to express sincere regret about that unfortunate fact. And when the Rabbi said: “we today stand in solidarity with the Islamic community in the country and all around the world,” he was simply insincere. The truth is to the contrary. Leading Jewish American institutions and lobbies have been at the forefront of advocacy of the war against Arabs, Muslims and Islam. Rabbi Lerner claims that he and his Tikun organisation “have called upon the United States Government to stand up for the Palestinian Government.” In fact, the Rabbi and his Tikun organisation do not support the most elementary of Palestinian rights such as the Right Of Return. The Rabbi claims that as a Jew he realises that “God has created everyone in God’s image and that everyone is equally precious.” Seemingly the Rabbi is confused. The religion Lerner describes is not Judaism that is tribal, exclusive and exceptionalist but Christianity that is universal and inclusive. In Judaism, Jews are chosen (what ever that means). The followers of the Judaic religion have invented a God who chooses them over all other people. This fact may explain why Rabbi Lerner doesn’t support a universal right of return in Palestine. His offering to the Palestinians is very limited. He effectively denies the Palestinian cause. [2012 June] A TIDAL WAVE OF POLITICAL LIARS LYING by Jon Rappoport The current political system of the United States is built on so many false flags, hidden agendas, crimes, and cover-ups, the intensity and quantity of lies has escalated to keep pace. Lie No. 1: I am convinced that our security is at stake in Afghanistan and Pakistan. This is the epicenter of the violent extremism practiced by al-Qaeda. It is from here that we were attacked on 9/11, and it is from here that new attacks are being plotted as I speak. Lie No. 2: It is important to recall why America and our allies were compelled to fight a war in Afghanistan in the first place. We did not ask for this fight. On September 11, 2001, 19 men hijacked four airplanes and used them to murder nearly 3,000 people. Lie No. 3: If I did not think that the security of the United States and the safety of the American people were at stake in Afghanistan, I would gladly order every single one of our troops home tomorrow. 10 BIG LIES in the U.S. "War on Terror"
The claim that there is "a recent assessment by the International Atomic Energy Agency that Iran's nuclear program has a military objective" is a lie. As Washington Post Ombudsman Patrick Pexton noted on December 9: 'But the IAEA report does not say Iran has a bomb, nor does it say it is building one, only that its multi-year effort pursuing nuclear technology is sophisticated and broad enough that it could be consistent with building a bomb.' 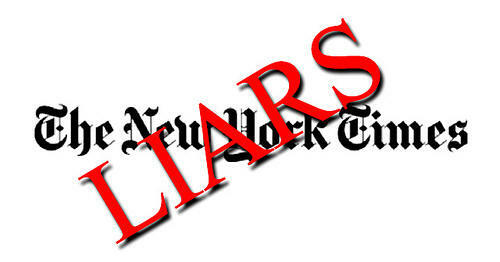 Indeed, if you try now to find the offending paragraph on the New York Times website, you can't. They took it down. But there is no note, like there is supposed to be, acknowledging that they changed the article, and that there was something wrong with it before. Sneaky, huh?